USA made it to the knockout round of this year’s World Cup. They got knocked out by Belgium, but the no question star for the U.S. was goalie, Tim Howard. 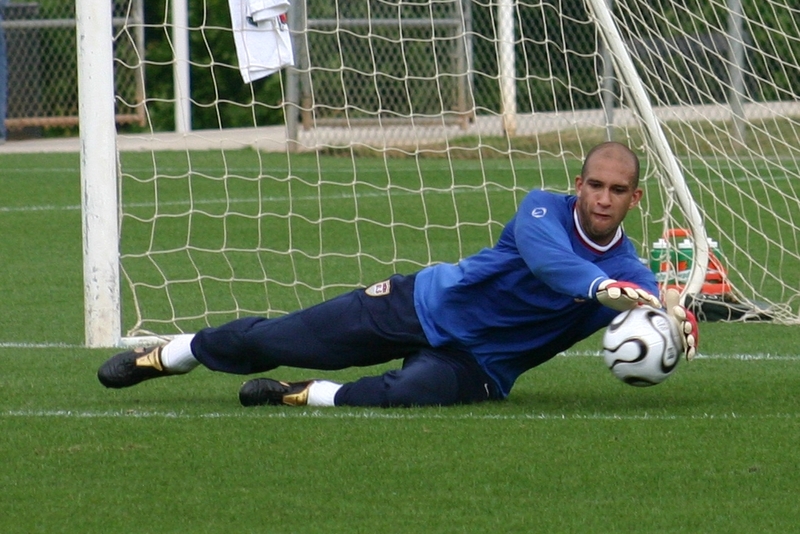 He set a record for the most saves in a World Cup match (which is great, but says something about the pressure Belgium was putting on the U.S.). I’ve worked with 2 soccer goalies in my career, both at the high school level, with one moving on to compete collegiately. I was curious to do some research and see what America’s top goalie did to get himself in the best shape possible for World Cup and international play. What are the athletic skills needed for a goalie? A free soccer kick can come screaming at a goalie upwards at 80 mph. At that speed, the 16 ounce ball strikes with about 5000 pounds of force. Howard has to react at these projectiles to block or catch them at a moment’s notice. In order to do that, he has to have the quickness and the strength to just launch his body around and block these balls. He has to be explosive and flexible so he can move forcefully and fast whenever he needs to. Howard needs strong core strength to initiate the explosive movements he has to make in a game. He also needs awesome agility in both his lower body for these movements and his upper body. I scoured the internet to find some exercises and drills that Howard does to develop these areas, so let’s take a look at them. The exercises that comprise Tim Howard’s workout. The first thing I found interesting about Howard’s workout was that he will do boxing to improve his hand speed, footwork, and punching of the soccer ball. He’ll go for 60 second rounds throwing jabs and blocking punches with hand pads. His team in Europe will have Howard do a T-test to test his agility. We do a T-Test at our facility for our clients, we just have different dimensions set up than Howard’s coaches. Plyometrics are used to develop his fast twitch fibers which will help his reaction time. He’ll do 30 inch box jumps to improve this area. Howard will also do skater pause jumps as well as overhead medicine ball throws to develop this explosiveness. He also does a tennis ball reaction drill to help those quick reflexes. With a partner standing 10 feet away, the ball will get tossed to the right or left without warning. Catch it before it bounces twice. Other drills Howard might use to develop core strength and explosiveness are kettlebell snatches, medicine ball wood chops, deadbugs (basically lie on your back and with arms overhead and legs off the ground, touch opposite hand and leg, return, and do the other side), and stability ball rollouts (I love this drill). If you are an aspiring goalie, all these drills are not too complicated. You can easily incorporate them into your training regime. If it is good enough for America’s best goalie, it certainly will be excellent for you. Do this and be a better goalie!